Funky, fresh strawberries with green leaves and little white pips. 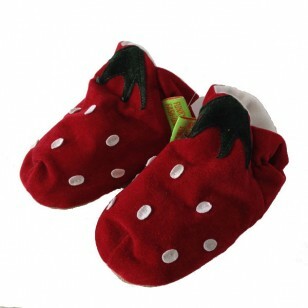 Our funky strawberries make super soft baby shoes and funky childrens slippers. These bright red strawberries are a pram shoe or a pre-walker. Plus with superb road holding they're cool for crawling, safe for first steps and wicked for walking. Perfect for nursery, kindergarten, school and home.